Does Mom need extra care? No one is young forever. At some point, people need to stop strenuous activity; they need to start medicinal regiments; they need to retire. Then, often, at some point they need to allow someone else to care for them. Nursing home – The family puts the aging member in a assisted living facility, where a full-time staff takes care of them. 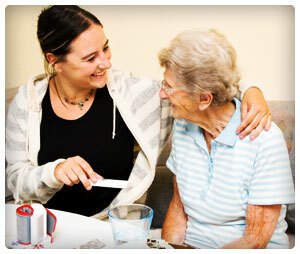 In-home care company – Some companies specialize in providing in-home care to elderly and disabled people, allowing the person to stay in their own home and receive the necessary care. Generally, they are the most expensive option. Family care – Family members (or friends) can visit the loved one to provide care in their home. So, the elderly family member still lives on their own. Family accommodation – A family member (or friend) welcomes the elderly member into their home, making it easier to provide necessary care. Also, always think of your loved one’s assets and what you will do with them. Missteps can lead to losing your rights to things of significant value. Which Option Is Best and When? Family member’s opinion – Talk to the aging family member, and at least consider what they want. It’s their life. Health – Your decision will depend largely on your relative’s health. If they need around-the-clock care or have a serious condition, a nursing home will probably be the best choice. However, if they only need an hour of help a day, or a few check ups a week, then in-home health care might be better. Financial limitations – Caring for someone costs money. Hiring an in-home health care provider might cost considerably more than a nursing home. Additionally, think about insurance and Medicaid — your family member’s insurance or Medicaid might shoulder the bulk of their care costs. Your time and obligations – Do you have the time to adequately care for a family member? If you work long hours, travel a lot, or just want some free time to enjoy your life, housing an elderly family member might be a bad idea. Quality of potential care – Your family member deserves legitimate care in their final years. Make sure you don’t choose an option that will undercut that goal, whether it’s a poorly-rated nursing home, an inexperienced in-home provider, or yourself. When Is a Nursing Home Best? Placing a loved one in a nursing home is the hardest option to take. Rarely is it something the aging family member will want. However, sometimes it is the best option. Generally speaking, it is most appropraite when there isn’t enough money to pay for in-home health care, putting the aging relative up in your home isn’t an option (no space, no one around to care for them), and/or the aging relative has a condition(s) that require serious care or continuous attention. If you feel that a nursing home is the best option, learn how to move your family member into one.